We’ll show you what your PDF’s tags should really look like! Simply email us a PDF and pick a page you’d like us to make Section 508 compliant. We’ll tag and return it to you within 48 hours at no charge. Limit of one page per customer; no forms, complex tables or documents requiring ocr please. There is no substitute for experience. We’ve specialized in PDF accessibility since 2000, longer than any other service provider in the world. We specialize in complex documents. Our experienced staff is innovative and up-to-date regarding the latest technology and federal guidelines regarding accessibility. We lead the industry in international standards development for accessible PDF. We offer the highest-quality, most cost-effective PDF tagging services available. We will work with you to help you create Section 508 “friendly” PDF files. Our service comes with our unique certification of Section 508 compliance: a simple, no-questions-asked guarantee. For organizations needing to deliver Section 508 or otherwise certifiably accessible PDF documents, our Specialists are ready and waiting to serve you. To get started, email your files to section508@appligent.com, and we will respond with a comprehensive quotation within 24 hours. If you have questions and would like to speak to someone, you can reach our Section 508 Coordinator at 610-284-4006. 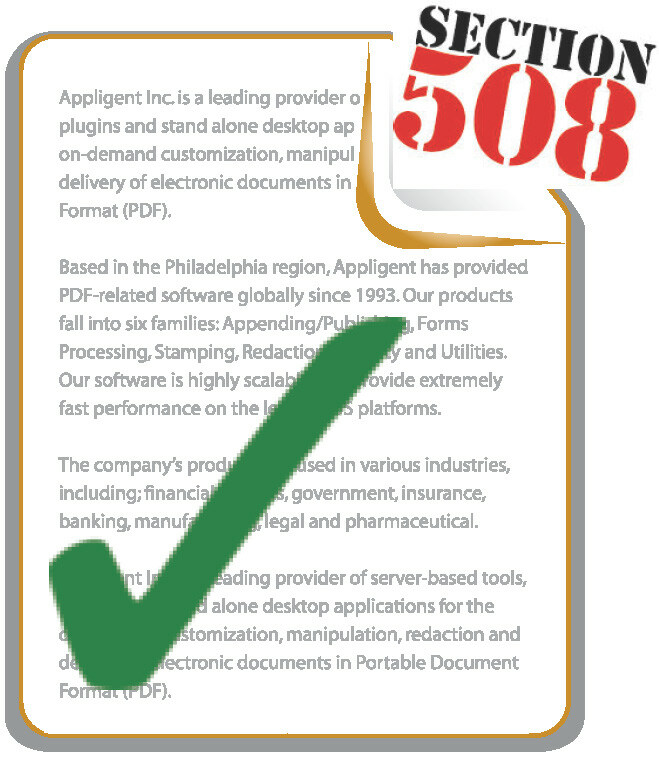 Appligent has expertly prepared Section 508 compliant documents for numerous organizations. Many of those organizations are listed here. Millions of U.S. citizens must use assistive technology (AT) in order to read electronic content. To meet their needs and to ensure equal access to information, the U.S. Congress enacted legislation in 1998 to require U.S. Federal agencies and contractors to produce accessible electronic documents. In 1998, Congress amended the Rehabilitation Act of 1973 to require Federal agencies to make their electronic and information technology accessible to people with disabilities. Section 508 was enacted to eliminate barriers in information technology, open new opportunities for people with disabilities, and encourage development of technologies that will help achieve these goals. The law applies to all Federal agencies when they develop, procure, maintain or use electronic and information technology. At least nineteen states have also passed legislation requiring electronic and information technology accessibility. Section 508 of the Rehabilitation Act does not place requirements on vendors. However, a vendor must design and manufacture products or services that meet the application Access Board’s technical provisions if it wishes to sell those products or services to the Federal government. Similar guidelines are in effect for vendors that deal with states that support Section 508. Currently available software is not capable of automatically tagging any PDF file for Section 508 compliance and certification. For organizations needing to deliver Section 508 or otherwise certifiably accessible PDF documents, our service bureau is ready and waiting to serve you. To get started, email your files to section508@appligent.com, and we will respond with a comprehensive quotation within 24 hours. If you have questions and would like to speak to someone, you can reach our Section 508 Coordinator at 610-284-4006. More information on Appligent’s Document Accessibility and Section 508 Compliance Services.